The projects are on display between Thursday 1 - Sunday 4 April. PixelACHE exhibition features projects ranging from interactive gym machines to experimental architecture. The common denominator for the projects is the search for new physical interfaces to audiovisual media. Many of the projects are still in their prototyping phase and are shown to the audience for the first time. Time to pump some iron. Sit on the workout bench facing the mirror, grab the bar hanging above you and begin your exercise. Your brands are your gestures, expose them daily. Consumption is an obligation, Happy Consumer! Show some discipline! My inspiration for Brandbody comes from an idea of brands resembling a gesture in that they broadcast our position and status in the society. In order to be accepted in his society, one has to not only act as a law-abiding citizen, but also as an active consumer. Consumption, i.e. using, wearing and exhibiting brands, has emerged from the idea of a free choice but ended in an obligatory civil activity. The omnipresent doubt and concern of one's status and acceptance keeps him alert and willing to contribute through the one and only act of duty, consumption. Brands grow useful and meaningful for the consumer when they are used regularly. Thus, brands generate a self-controlled and self-disciplined bond between the individual and the consumer society. Brandbody v2.0 is an interactive media installation. The installation consists of a mirror and a custom made workout bench. An exhibition visitor sits down facing the mirror and begins the workout. 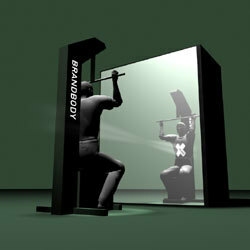 By pulling a bar above him, he sees his upper body projected with video material. 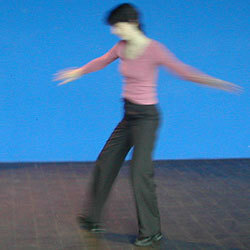 The projected media and the soundscape are directly controlled by the exercise carried out by the visitor. The speed and tempo of the pull and the obedience to the program, controls the continuation of the program. The user and the possible accompanying visitors will see this visual content as "worn on" the user. The image we want to portray of ourselves is vital to our relationship with brands. The awareness of being watched and evaluated by other visitors is an important factor in the Brandbody experience. 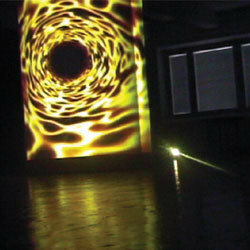 Distributed Projection Structure is an architecture prototype where physical matter is animated by algorithmic light. Layers of digital information, behavior and ambience are sharing projection territories, and creating a structure embodying media. This project is part of an ongoing research and development process where we hope to explore some pressing issues that architecture is facing today with the advance of new technologies into the social realms. Exhibitions are used as a test bed for later evaluation, how certain issues and spatiality are responded to by visitors and the professional discourse. Anita Pozna [HU/SE], Péter Hudini [HU/ES]. Scoop is a prototype of an information reactive table, a messageboard to be used with portable devices. 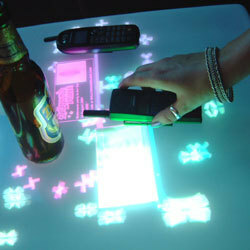 Placing your portable device on the table, the information aura of your personal device appears. Placing objects close to each other enables information exchange. 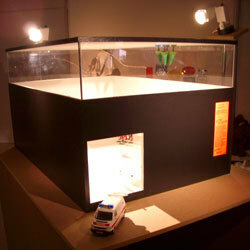 The table works as a tool for visualising the invisible information flow. Thru’ & Thru’ is a 360-degree video installation on a cylinder. 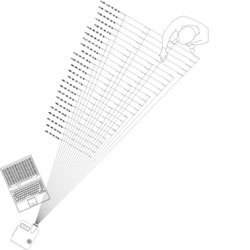 Video is projected from two opposite directions, creating an edgeless, 360-degree projection surface where any picture can continously revolve around and around and around. The result is an ongoing journey of a person, a bus, and a landscape perpetually moving forward in an edgeless, endless dimention. There are no single destinations, only multiple journeys. The original gallery version of the work is an ambient narritive about one man on a journey. He emerges into a void, white, round dimetion where he can walk in one direction and still keep coming back to where he left from. He makes his way on a bus. He arrives at a landscape. As he stands still, the landscape behind him revolves and changes and revolves as he stands there. He walks around once more. The voyage abstracts onto a chaos of running, colors flowing faster, and neverending landscapes. Certainly, the man has gone somewhere, but the world that he lives in looks exactly as incoprehensibly similar, as identical as before. Thru’ & Thru’ (Vol. 2) - LASIPALATSI CLOCKTOWER . Thu, 1.4 - Sun, 4.4, 8pm - 12pm. Further volumes of Thru’ & Thru’ are projected onto existing monuments and architecture in public envirnoments. Each site gives a new context to the work and is an exciting challenge and opportunity to show different interpretaitions of the work - different points of view about travelling. The central location of the Lasipalatsi Clocktower urges me to apply images of buses and crowds revolving around and around, as they do in central Helsinki. At the same time, the size and visibility of the tower allows an uplifing contrast to the reality of the form, in a transformation, where it becomes an amazing tower of galactic space energy and color patters. Thru’ & Thru’ has been supported by City of Helsinki, Lasipalatsi Media Centre,Kruunuradio (Vol. 1) and RGB Oy (Vol. 2). The "Stop Motion Studies" are a series of experimental documentaries that chronicle my interaction with subway passengers in cities around the world. The aim of the project is to create an international character study based on the aspects of identity that emerge. It is said that 90% of human communication is non-verbal. In these photographs, the body language of the subjects becomes the basic syntax for a series of Web-based animations exploring movement, gesture, and algorithmic montage. 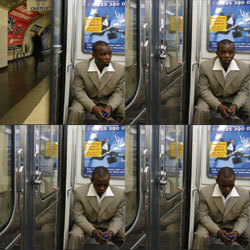 Many sequences document a person’s reaction to being photographed by a stranger. Some smile, others snarl, still others perform. Some pretend not to notice. Underneath all of this are assumptions and unknowns unique to each situation. The "Stop Motion Studies" (www.stopmotionstudies.net) extend my long standing interest in narrative and, in particular, look at the subway as a stage upon which social dynamics and individual behavior are increasingly mediated by digital technology. As one of the most vibrant and egalitarian networks in our cities, subways bring people from a wide range of social and cultural backgrounds into close contact with each other. This process plays a significant role in shaping both the character of a city as well as our individual identities. By celebrating both public transportation and the internet, the Stop Motion Studies draw a parallel between the two and posit them as inclusive technologies in opposition to more exclusive forms of transportation (automobiles) and media (television). In doing so, the project brings real life and the internet together in as far as it models each system -- the subway and the internet -- in relation to the other and celebrates the inclusive spirit of both networks. By tapping into and representing the information superhighway of the subway, the project arrests time and allows users to analyze events which are often otherwise only experienced subliminally. Ultimately, everything is such that it invites prolonged reflection. While the animated sequences that comprise the project paint portraits and tell stories by documenting the interaction between passengers themselves, the most powerful moments are those in which a passenger enters into an exchange with me as a photographer, an exchange based solely on visual cues and body language and one which reveals something about each other’s identity and character. In doing so, the project probes the "scripts" that we live by in our day-to-day interactions with strangers. 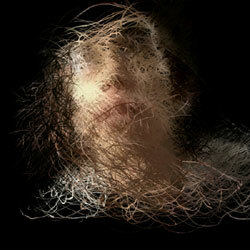 Stop Motion Studies is a project by David Crawford [US/SE]. Aquatic is an interactive media installation inviting the audience to participate in a multisensorial experience. It is a three-dimensional interactive water soundscape to be explored through bodily movements within the space of the installation. The visitors hear the water soundscape as the accurate feedback following their movements. The soundscape handles three emotional states free to one's interpretation: soft and quiet waters, refreshing streaming waters and tempest waters. Aquatic proposes an immersive and poetic experience of imaginary water worlds playing with kinaesthesia and sound images. It gives the main role to one's imagination in the building of the experience of immersion. It proposes a reflection about the influence of sounds on our sense of space and our imagination. How sounds, bodily movements and interaction arouse in us body memories and sensations. Aquatic explores with poetical means the sensation of ubiquity proper to augmented reality. Aquatic is situated inside an architectural environment. The installation uses the structures and circulation paths of this architecture to lead the visitors into the sensitive empty space of Aquatic. The shapes, lights and the poetic of the architectural space influence on the visitor's sensations and the building of the imaginary world suggested by Aquatic's soundscape. The acoustic, circulation paths and architectural spatiality influence on the various movements the visitors might perform inside Aquatic and therefore on the resulting soundscape. Aquatic deals with divers aspects of performance and theatre transgressing the boundaries between viewers and actors mastering an environment. As a motion driven audio system, the technical realisation of the installation uses David Rokeby's soft VNS for bodily motion tracking through a video sensor and video processing, and Max Msp for ruling the interaction between motions and sounds. Aquatic is a project by Marianne Decoster-Taivalkoski. of the Modern Talking soundtrack by abnormalaudio. Swarm is an interactive video installation that implements the mathematical pattern of flocking birds as a constantly moving brush stroke. 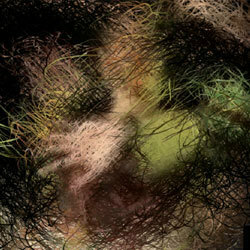 Taking inspiration from Jackson Pollack’s "drip and splash" technique of pouring a continuous stream of paint onto a canvas, Swarm smears colors captured from live video input, producing an organic painterly effect in real-time.